Customers visit any eligible Tim Hortons restaurant in Canada to receive a reusable loyalty card or download Tims Rewards to a digital wallet on an iPhone or android device and use it the same way as you would use a reusable loyalty card. 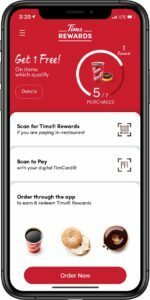 They can also download the updated Tim Hortons mobile app, which allows them to track status, scan for rewards and order directly through the app where they currently earn visits and redeem rewards. Tim Hortons is one of North America’s largest restaurant chains operating in the quick service segment. Founded as a single location in Canada in 1964, Tim Hortons appeals to a broad range of guest tastes, with a menu that includes premium coffee, hot and cold specialty drinks (including lattes, cappuccinos and espresso shots), specialty teas and fruit smoothies, fresh baked goods, grilled Panini and classic sandwiches, wraps, soups, prepared foods and other food products. Tim Hortons has more than 4,800 system wide restaurants located in Canada, the United States and around the world.